This week's books came from the library and the Scholastic BOGO sale at M's school. We ended up getting four books from the book fair, but I've already reviewed one: Library Mouse by Daniel Kirk. We had gotten it from the library in the past and decided to buy it at the book fair. We haven't had a chance to read the fourth book, so I'll tell you about two of the Scholastic books and two from the library. First up is Happy Birthday, Bad Kitty by Nick Bruel. C really likes the Bad Kitty books so he picked this one out and read it the same day we bought it. It's 160 pages, but there isn't much writing on each page. There are lots of silly illustrations throughout. The book is all about Bad Kitty's birthday. There are preparations to be made and lots of friends who are introduced. It's a very silly book, but there are also some real facts about cats that are interspersed with the fun story. It teaches why cats sleep so much, why they like to scratch things, when they're old enough to leave their mother, and why chocolate is bad for cats. C seems to like the book. Another Scholastic book we got is Dino Parade by Thom Wiley. M picked this one out. 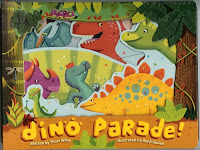 It's a big, hard board book that opens up to reveal a parade of dinosaurs. All the pages are cut and unfold to create a long line of dinosaurs on both sides. One one side, there's a story about watching a dinosaur parade. On the other side, there are pictures of each of the dinosaurs with their names and pronunciation. This is very helpful! Now on to a library book. I picked up a Step-into-Reading book for M called Smash Trash by Laura Driscoll. It's based on the beginning of the movie WALL-E, where the robot is responsible for compacting trash. It's a very simple, easy-to-read book for early readers. M can read it, but it is a bit long so she hasn't read through the entire thing. She usually asks me to finish when we get about halfway through. If you have a beginning reader who likes WALL-E, I recommend it. Finally, we got yet another book in the Geronimo Stilton graphic novel series. This one is called Who Stole the Mona Lisa? . C read it within a couple hours of me bringing it home from the library. He really loves this series. The stories are fun, they take place in historical places around the world, and he enjoys the graphic novel format. In this book, the Pirate Cats go back to Venice in the 1500s to kidnap Leonardo Da Vinci, and Geronimo Stilton and his family go back in time to stop them. In addition to teaching a bit about the time, it also shows that Da Vinci was an inventor as well as an artist. Who Stole Mona Lisa sounds like an interesting book. I might have to get it for the boys when they're reading better. I bet my kids would love the dino book! I am very curious about the first book - have to look for this series. Thanks for joining WMCIR! Ah, my kids used to love the book fairs! Looks like you got some good ones.